Bagels - New York's favorite breadstuff. Cheese Recipes - High in protein and calcium. Chinese - The finest dishes inspired by oriental East Asia. Coffee - Different ways to enjoy this hot drink. Curry - Hot Asian cuisine. Lamb - Tender red meat, often served with mint. Pie - Both sweet and savoury pie ideas. Pineapple - Tangy, refreshing fruit native to South America. Pork - Delicious ham, bacon and pork recipes. Salmon - American salmon fish recipes collection. Spinach - Leaf vegetable rich in iron and calcium. Valentine - Show that special someone you really love them. 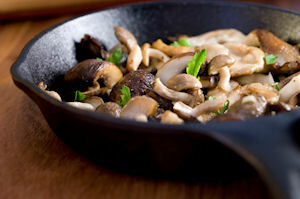 There are thousands of regularly harvested edible mushrooms in the world. Some species are highly prized because they are not or cannot be cultivated and must be harvested from natural settings. In Ancient Egypt, mushrooms were so highly regarded that the pharaohs decreed that they could only be eaten by royalty and no commoner could even touch them, giving the royal family the entire available supply.